"What do you want out of life?" 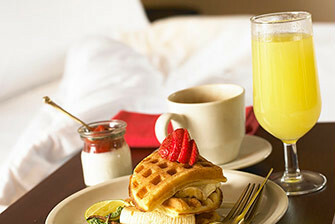 - "Room service"
Perfect for early-risers, a romantic dinner for two, nighttime snacks, or a small gathering. Relax and enjoy our delicious cuisine in the comfort of your guestroom. Our In-Room Dining menu features a wide variety of delicious dishes as well as complete bar service. For our younger guests check out our children's menu.